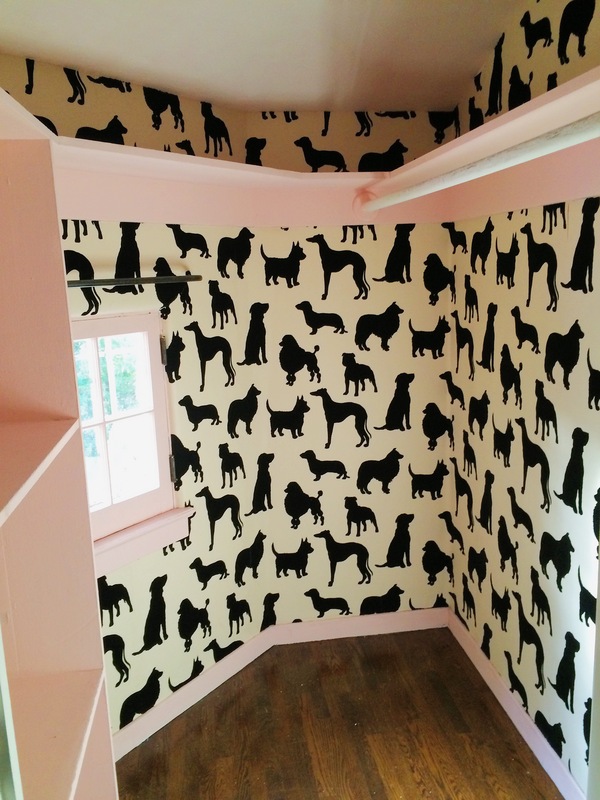 One Room Challenge: Wallpaper Is Up! My wallpaper hanger told me that you can get addicted to putting wallpaper up in your home. Yep, guilty. Once you start, you can’t stop. It’s just so satisfying and transforming. As a reminder, I’m redoing my daughter’s walk in closet. It’s squeal worthy for me and my little girls. I really am making my big girl dreams come true in my little girl’s closet. I had originally wanted to change out the existing closet bar with a lucite one but then I had it priced out and it’s hilariously expensive. Guess what 2 year old does not get a $600 lucite closet bar? The existing one will get painted either pink or black this weekend. Thoughts on color? I still need to paint out the closet bar, change out the light, put up their little tote bags on the far back wall for a dress up space and sew cafe curtains for that cute little window. Not much left to go…we’re chugging right along. Also, I wanted to let you know that I’m guest posting over at the wonderful blog Aquahaus. It’s breast cancer awareness month and I’m talking about my cancer scare as well as sharing pink in my home. This subject is very near and dear to me so I’d love it if you checked it out. Plus, you’ll get sucked in to Celine’s amazing blog and cool style. It’s SO good, Kate! I would be laying on the floor with a silly grin if I were you! I toyed with doing a lucite shower curtain rod…but I decided to save my pennies, too. I’d paint it out black, I think. Kate, it’s flipping adorable! The pink paint color is perfect too. 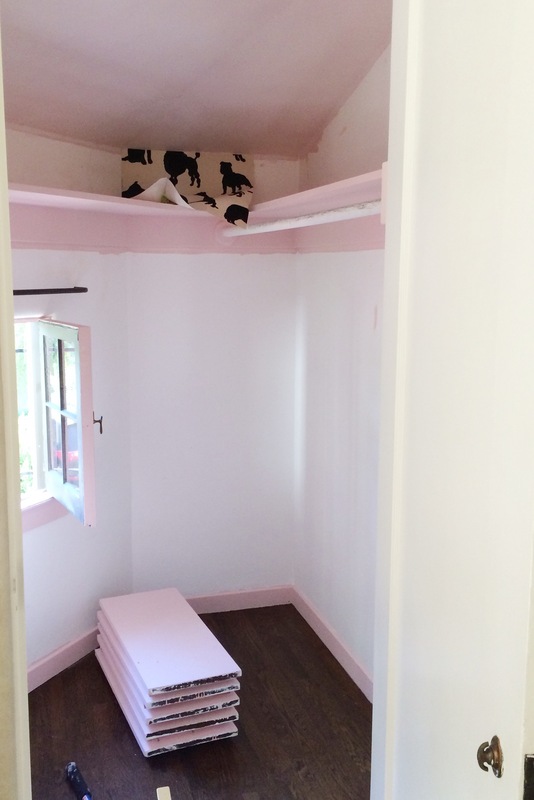 I’d paint the closet bar the same pink to blend in with the woodwork and not compete with the wallpaper. Let the black there be the thing that jumps out at you. Looking so good! Oh my goodness I love it!!! A $600 lucite closet bar? Wow, that’s insane. Definitely don’t think girls will notice the difference ; ) Can’t wait to see the final reveal! Thank you, Fran! I’m excited!! Sorry if I was misleading but I’ve never had cancer. I talked about a cancer scare that I had right after my dad passed away from cancer and how scary it was to go to a Dr but also how important. I edited my post so it’s hopefully not misleading. God bless your mom and her strong fight! Seeing my dad go through chemo, I know it’s a very intense battle. That looks amazing! I love it! You can totally make the lucite bar for cheap, i will email you the links I found! Otherwise you can paint it pink! It is amazing! My inner child is incredibly jealous. What a lucky little girl. I have always wanted to use that wallpaper. You’ve put it to great use. I can’t even with this- so so soooooo good! Can I be your daughter?! Love the walloper with the pink it’s so good. oooh I love this closet! 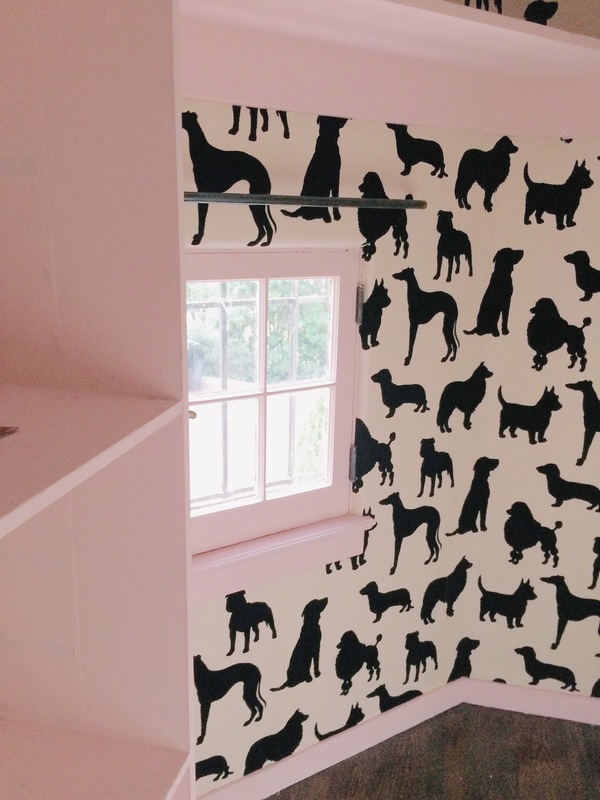 This is such a classic and playful wallpaper. I think doggies grow with kids well – they’re not going to age out of puppies! I have multi-colored dog patterned Roman shades in my son’s room. Another vote for a pink-painted bar. Let it blend into the background (and any scratches on the paint will be less obvious, too – kind of like light pink nail polish!). That delicious wallpaper is going to make the whole space. I love it! Your girls are going to have so many wonderful adventures in that sweet little space. This is soooo adorable!!! Love it!